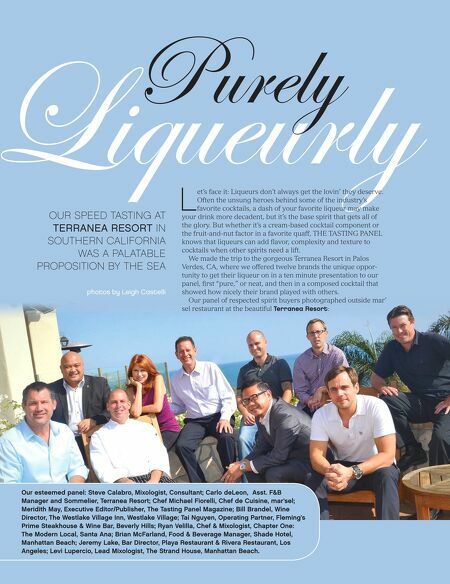 Liqueurly Purely OUR SPEED TASTING AT TERRANEA RESORT IN SOUTHERN CALIFORNIA WAS A PALATABLE PROPOSITION BY THE SEA photos by Leigh Castelli L et's face it: Liqueurs don't always get the lovin' they deserve. Often the unsung heroes behind some of the industry's favorite cocktails, a dash of your favorite liqueur may make your drink more decadent, but it's the base spirit that gets all of the glory. But whether it's a cream-based cocktail component or the fruit-and-nut factor in a favorite quaff, THE TASTING PANEL knows that liqueurs can add flavor, complexity and texture to cocktails when other spirits need a lift. 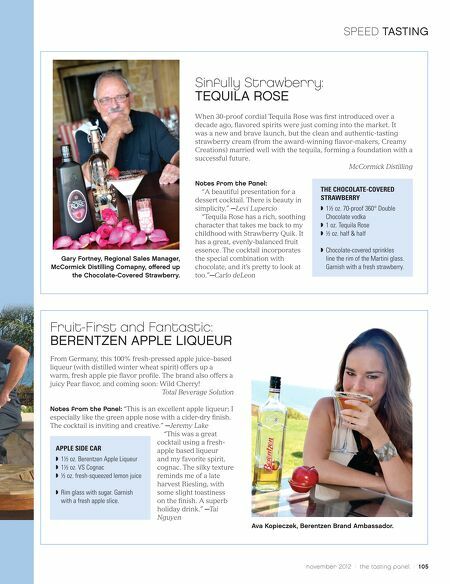 We made the trip to the gorgeous Terranea Resort in Palos Verdes, CA, where we offered twelve brands the unique oppor- tunity to get their liqueur on in a ten minute presentation to our panel, first "pure," or neat, and then in a composed cocktail that showed how nicely their brand played with others. Our panel of respected spirit buyers photographed outside mar' sel restaurant at the beautiful Terranea Resort: Our esteemed panel: Steve Calabro, Mixologist, Consultant; Carlo deLeon, Asst. F&B Manager and Sommelier, Terranea Resort; Chef Michael Fiorelli, Chef de Cuisine, mar'sel; Meridith May, Executive Editor/Publisher, The Tasting Panel Magazine; Bill Brandel, Wine Director, The Westlake Village Inn, Westlake Village; Tai Nguyen, Operating Partner, Fleming's Prime Steakhouse & Wine Bar, Beverly Hills; Ryan Velilla, Chef & Mixologist, Chapter One: The Modern Local, Santa Ana; Brian McFarland, Food & Beverage Manager, Shade Hotel, Manhattan Beach; Jeremy Lake, Bar Director, Playa Restaurant & Rivera Restaurant, Los Angeles; Levi Lupercio, Lead Mixologist, The Strand House, Manhattan Beach.